We had the honor of having Phase Three featured on the wonderful, cooking blog, My Wooden Spoon. Lori Falcon, the editor of My Wooden Spoon, is a popular blogger and a Lifetime Mom! In the blogging world, she is known as A Cowboy's Wife, and she has a personal blog by the same name, that is a fun read as well. 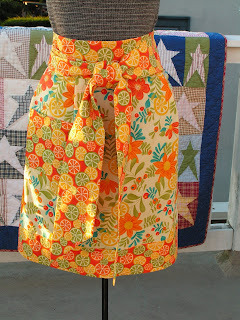 Lori's favorite apron is one of our newest, which we call our Vintage Fruit Apron. It was created using fabrics from the Sweet Treats collection by Darlene Zimmerman for Robert Kaufman. 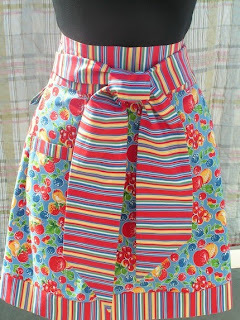 We love the fabric in this apron and how the fruit gives it a vintage look while the stripes gives it a modern touch. We are so honored that My Wooden Spoon featured it and highly recommend you read Lori's blogs regularly for great ideas, recipes and giveaways! We haven't posted anything in so long. In our attempts to get ready for Fall shows and getting addicted to twitter, we have neglected to keep the Phase Three blog up-to-date. 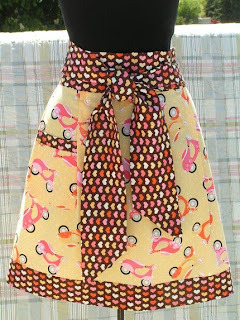 But, we have a lot of fun news to share and some pretty aprons in the works, so you should see us around more often! Citrus Apron Makes a Comeback! We are really excited that we found fabric to make a couple more of these this year and you will see it in our shop when it opens up mid-May. We will only have 2 or 3, so if you are interested in reserving one, please let us know. 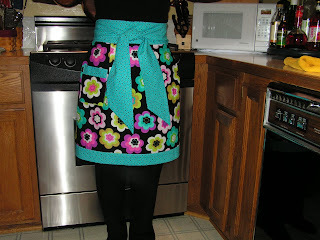 The blog, Two of a kind, working on a full house, is hosting a giveaway for a gorgeous apron from Jillie Willie. Head on over and enter to win by May 13th. 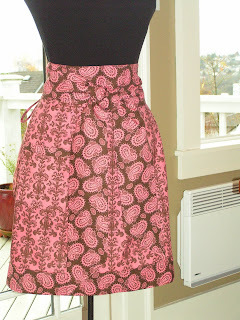 After much needed rest for ourselves and the sewing machines, we are back to designing and sewing aprons and we will be stocking our etsy shop....beginning May 13th....with a ton of great styles for spring and summer! Now let's just hope the sun stays out! The lovely Anne of Anne's Food blog is hosting a giveaway. 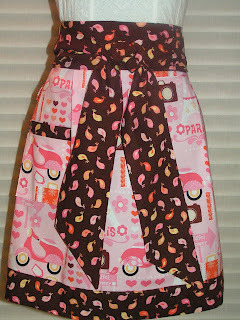 One lucky winner will receive one of our Pink and Brown aprons. Please head over to her blog to enter. For the duration of the giveaway, we are also offering free US shipping and $5 international shipping. This might just be the time to get the rest of your holiday shopping done!